On April 8, I flew thousands of miles to be surrounded by monsters, gore and body parts. No, I didn’t go to Burma this year, but rather opted for Burbank and the third annual Monsterpalooza convention. The three-day show was created in 2009 by East Coast native and monster fan Eliot Brodsky. Monsterpalooza is the best con I’ve been to since the early days of the Chiller Theatre show in Jersey. Monsterpalooza is a monster show – period. Monster masks, monster models, monster make-up, monster props, monster toys, monster décor and monster-themed jewelry lined every crack, crevice, alcove and hallway of the Marriott Burbank Convention Center. The autograph-hocking celebs were limited to a large handful, and I (mercifully) spied only one or two tables laden with the obligatory bootleg and import horror DVDs. No boring filler at this con, folks – Monsterpalooza delivered on its name. Most of the table space was occupied by working FX artists, mask makers, resin model kit producers and other assorted crafters. I was surrounded by so much stellar work that it’s tough to single out some highlights. Legendary sculptor and monster maker Mike Hill stole the show with his life-size lineup of classic movie monsters, including Henry Hull from Werewolf of London, Oliver Reed from The Curse of the Werewolf, Charles Laughton as Quasimodo and two Karloff monsters: one from Bride of Frankenstein and the other an enormous five-foot-high wall hanging of the monster’s head. Impressive doesn’t begin to describe Mike’s work. Movie FX artist (and this writer’s old roommate from art school) Russ Lukich brought along a couple of friends named Lon Chaney and H.P. Lovecraft. Both pieces were life-size silicone figures that perfectly captured the look and spirit of each subject. 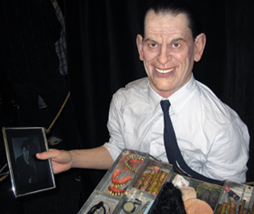 Chaney’s classic pose with his make-up case is so spot-on that even the position of his tie matches the original photo. On the non-mask/model front, Chicago-based artist Melita Curphy had a killer spread consisting of much tentacle-inspired goodness (and who doesn’t like tentacles?). Melita had an assortment of pendants, hair gear, t-shirts and handmade leather accessories. Visit Melita’s online store to see what all the hubbub’s about. 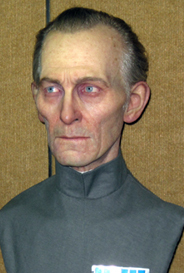 My favorite piece, however, has got to be mask maker and creature designer Jordu Schell’s Grand Moff Tarkin. In addition to being one of my favorite Peter Cushing roles, Tarkin is one of those great Star Wars characters who never gets enough play in the figure market. This silicone bust is so ridiculously lifelike in person that when I went in for a close look, I swore I could hear millions of voices crying out in terror. But…they were suddenly silenced, so I could be wrong. Check out Jordu’s site for more photos of this amazing piece! 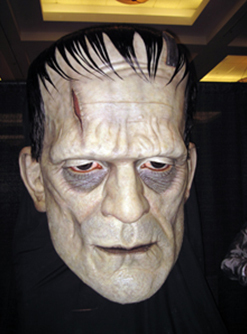 The con also featured a monster museum that showcased a large number of life-size busts and standups contributed by various artists, private collectors and FX shops. 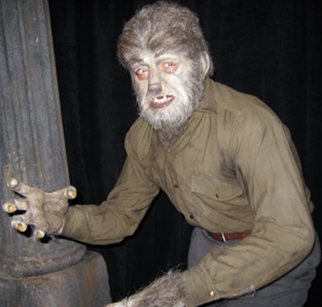 My personal favs from the museum were both Mike Hill creations: Lon Chaney, Jr.’s iconic alter-ego, the Universal Wolf Man and horror’s original head-turner, Regan MacNeil from The Exorcist. These figures were as flawless up close as they appear in photos. I’m a sculptor myself and seeing this work in person was a religious experience. Convention attendees were not limited to the average collector and fan – Guillermo del Toro, John Favreau and J.J. Abrams all popped in over the weekend for a monster fix, as well as seven-time Academy Award winner and FX god Rick Baker. My apologies to the esteemed Mr. Horvath and to you, Dear Reader, for not returning with any interviews. I did pass Guillermo at one point, but like a kid in a latex candy store (yeah, I just wrote that), I was so excited by the show I missed my chance to say hello. Monsterpalooza reminded me of how much I absolutely love the creepies and the crawlies that slither out of our nightmares. I also learned that, convention-wise, the West Coast is the place to be. If you can find the time and can make the journey, DO NOT miss Monsterpalooza 2012 next April! For more terrors from Monsterpalooza, check out these photo galleries here, here and here. Rob Roberts is a sculptor with some impressive work of his own. Check out his website to learn more.